A rotor is required to run a Wind Turbine. Once a rotor is placed inside the GUI, the turbine is given sufficient space, and the wind level is strong enough for the rotor, the Wind Turbine will generate Kinetic Energy. 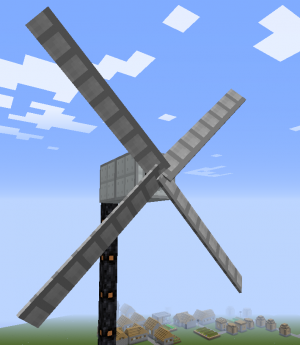 This can be converted into EU with a Kinetic Generator placed next to the turbine. Motor efficiency: Related to rotor type. The wind strength, measured in MCW, is affected by 3 factors: Height, Weather, and a Random Factor. Height is a main factor of wind strength. Below y = 64, there is never enough wind, and the generator will not create EU at all. Wind is strongest at around y = 160. There is very little wind at y=255, hence no point attempting to run a wind turbine that high. Weather also give boosts. Rainy weather will yield a 25% boost. Stormy weather will yield a 50% boost. At every update, the wind direction may change +18 degree or -18 degree or not change. The three choices have same probabilities. There's no evidence that the wind direction will affect EU generation. The easiest way to check the current wind level in an area is by using a Windmeter. For the most part, the only real space requirements of the Kinetic Wind Generator are the rotor blades. This will occur if there is another KWG behind it and in range of the rotors up to 22 blocks away. Specifically, the distance is 3x the radius of the rotors. Because of this, it is considered impractical to have Wind Turbines set up as such, instead it much more preferred to have them in a line (Figure 3) or in a grid (Figure 4). The efficiency of rotor equipped by the Wind Turbine will strongly affect the output of the generator. Each rotor has a different material cost, durability, and wind speed requirement. This means that even the lowly Wood Rotor can be useful in some circumstances where wind levels are not sufficient to run a larger rotor. If wind strength exceed the max wind strength of rotor, the rotor will still work, but will cost 4 times durability. This page was last edited on 11 March 2019, at 03:39.